I’m the sort of person who reads up on movies before I go and see them. It’s very infrequent I just see something on a whim — but Push was one of the rare movies I went in blind. And somehow, in the age of today’s superhero blockbusters, it still stands as one of the most interesting superhero movies I’ve ever watched. Welcome back to “In defense of,” io9’s semi-regular series defending works of pop culture (and science) that are unfairly dismissed or despised. 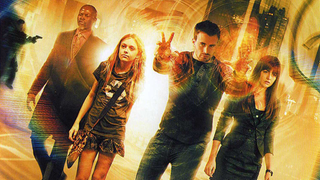 For those unfamiliar, Push was a 2009 movie set in a world where people could be born as mutants with with psychic powers — things like telekinesis, clairvoyance, memory alteration — and the shadowy U.S. agency that hunts them down and experiments on them. And although critics vehemently disagree, I loved Push when I first saw it, and in the context of 2015 with DC and Marvel heroes dominating the big screen, I think I love it even more. 2009 was Hollywood on the cusp of superhero boom — Iron Man kicking off the MCU and The Dark Knight redefining the “serious” comic book film the year before, we were about to dive into the global comic book phenom we’re in the midst of today. These movies are huge, sweeping superheroic epics, big stakes, big explosions, a sense of grandeur on grand scales. Push? Pretty much the opposite. Shot on location in Hong Kong by Paul McGuigan, it was a small-scale action thriller that happened to feature characters with psychic super powers. It didn’t deal with the end of the world or with villains who wanted to rule the galaxy; it was about a small group of powered people on the run from the government. The action wasn’t meaningless splendor, existing to merely so we could admire all the explosions and energy beams. It was staccato gunfire and invisible psychic pushes — action that served the story, rather than interrupted it. It was proudly small and intimate, already unique enough for a superhero movie in 2009. But today, alongside the likes of Age of Ultron or Batman v. Superman? That kind of movie just doesn’t happen any more. But that wasn’t the only thing that made Push unique. It was also a new world, not an adaptation or a reboot or anything. It didn’t rely on a ready-made fanbase or on callbacks to some source material. It teased this weird world of psychic mutants and government experimentation (it was basically what Heroes should’ve been as Heroes was going off the deep end). The interplay of the various different kinds of psychic powers was interesting and never felt like they were ever used to break the rules established by the story. There was promise for an intriguing new world, one fleshed out with some impressive worldbuilding, and one that sadly we never really got to see much more of. If you find the epic blaring of today’s big-ticket superhero movies a little tiring sometimes, give Push a watch. It might be small-scale, but it’s still fun and intelligent superpowered goodness.